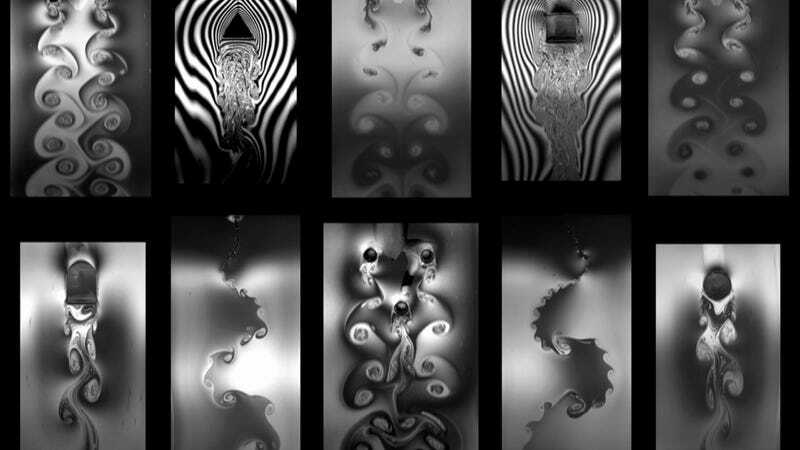 Although many advanced experimental ﬂow visualizations, such as particle image velocimetry or laser Doppler velocimetry, have been developed and used in ﬂuid dynamics research, the use of ﬂowing soap ﬁlms has remained as an educational tool and economical visualization technique to study ﬂuid-structure interaction and hydrodynamic instability in two-dimensional ﬂuid ﬂows. Making use of the optical properties of the soap ﬁlm and high-speed photography, the wake evolution and vortex patterns behind different bodies can be tracked and captured. I'll be honest, I have a pretty limited understanding (ie none whatsoever) of what's giving rise to these interference patterns, let alone what these fluid structures are called (according to FYFD, highlights in this set of images include "wakes behind bluff bodies, interacting cylinders, and flapping flags"), but wow — talk about stunning.